Three high quality rear view cameras designed for use in commercial vehicles and motorhomes have finally found their way into the product range of the Swiss multimedia specialist ZENEC: the ZE-RCE3702 for the Fiat Ducato, Citroën Jumper and Peugeot Boxer, the ZE-RCE4606 for the Mercedes Sprinter and VW Crafter, and the ZE-RCE5002 compatible with the Renault Trafic, Opel Vivaro, Nissan NV300 and Fiat Talento. 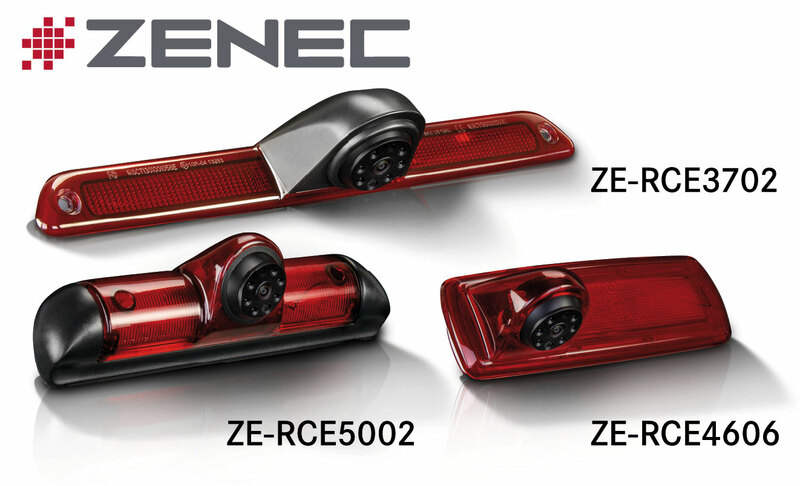 ZENEC's new rear view cameras replace the original third brake light of the target vehicle offering Plug & Play connection. " Press can find more detailed information in ZE-RCE3702, ZE-RCE4606, ZE-RCE5002 press. Great infotainment package for the AUDI A3 at a very attractive price is the verdict of the German Car & HiFi magazine (issue 2/2019) on the Z-E3150 from ZENEC, awarding it a HIGHLIGHT accolade. The Swiss firm ZENEC is a specialist for in-car navigation systems and multimedia systems, impressive for their state of the art features and ease of use. With the Z-E3150, ZENEC now has an innovative retrofit solution for AUDI A3 8P/8PA models in its product range. The German Car & HiFi trade magazine has just thoroughly tested the new ZENEC in issue 02/2019, awarding it the "Highlight" accolade. "The Z-E3150 performs brilliantly in the lab and in the field", conclude the experienced testers. "The feature set is complete, the performance convincing, and the vehicle integration perfect. A great infotainment package for the AUDI A3 at a very attractive price!" Press can find more detailed information in Z-E3150 press. 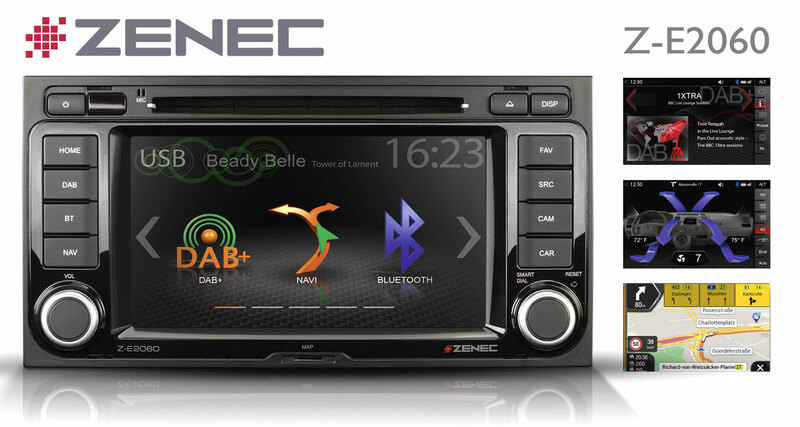 Equipped with 9 inch /22.9 cm High Definition touchscreen, the new ZENEC 2-DIN system provides maximum entertainment with the greatest possible ease of use. With the HD display infotainer Z-N956, the Swiss multimedia specialist ZENEC has an absolute premium device in its product range. Highlight of the new ZENEC infotainer is the big capacitive 9 inch / 22.9 cm HD high definition touchscreen with a resolution of 1280 x 720 pixels. The Z-N956 is Google Android Auto certified, featuring an advanced Bluetooth unit, and two USB ports that can be used for A/V playback and for connecting iPhones or Android smartphones. The integrated DAB+ twin tuner offers digital radio reception with impressive sound quality. For the Z-N956 two navigation packages are available that expand the infotainer for specific purposes: the Z-EMAP56 for cars, and the Z-EMAP56-MH specially for motorhomes. Both navigation packages contain digital maps for 47 European countries with 6.5 million Premium POIs. The map data can be updated for 3 years free of charge." Press can find more detailed information in Z-N956 press. ZENEC's 2-DIN infotainer for the AUDI A3 combines the latest multimedia functions with optimal in-vehicle integration and can be easily upgraded to a naviceiver. 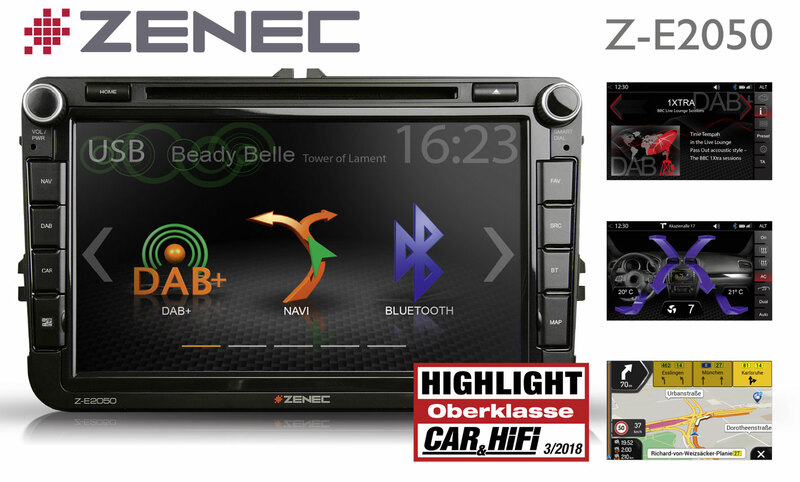 Multimedia specialist ZENEC expands its product range with another vehicle-specific E>GO infotainer: the Z-E3150 is the optimal multimedia retrofit for all AUDI A3 8P/8PA models. 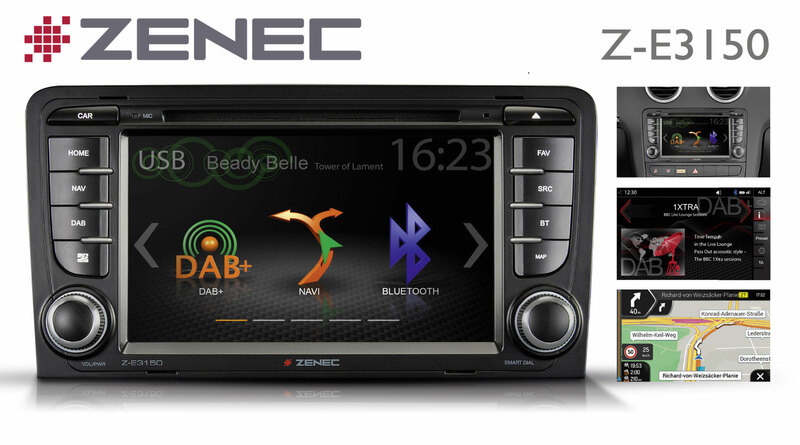 Top DAB+ radio reception, Bluetooth, comprehensive media compatibility and easy smartphone connection – the Z-E3150 is an allrounder that is conveniently controlled from the capacitive touch-sensitive 7"/17.8 cm screen. With a navigation package, obtainable separately, the Z-E3150 can also be upgraded to a navitainer with 3D maps of 47 EU countries, more than 6.5 million points of interest, Lane Assist, and TMC." Maneuvering and parking made easy – ZENEC's new rear-view camera for recreational vehicles is easy to fit and flexible in use. Multimedia specialist ZENEC has added a new rear-view camera to its range of accessories. The ZE-RVSC200 has been specially developed for use in partially and fully integrated motorhomes. This very compact twin lens model has two camera modules with different angles of view. In the upper part of the camera housing is Cam1 (45° horizontal angle of view), which primarily does the job of an interior rear view mirror. The lower camera lens Cam2 (100° horizontal angle of view) is mainly intended for backing up. It records what is to the rear of the motorhome within a range of up to 5 meters, which can be individually set. Cam2 is supported by a built-in microphone and the IR-LED night illumination system. 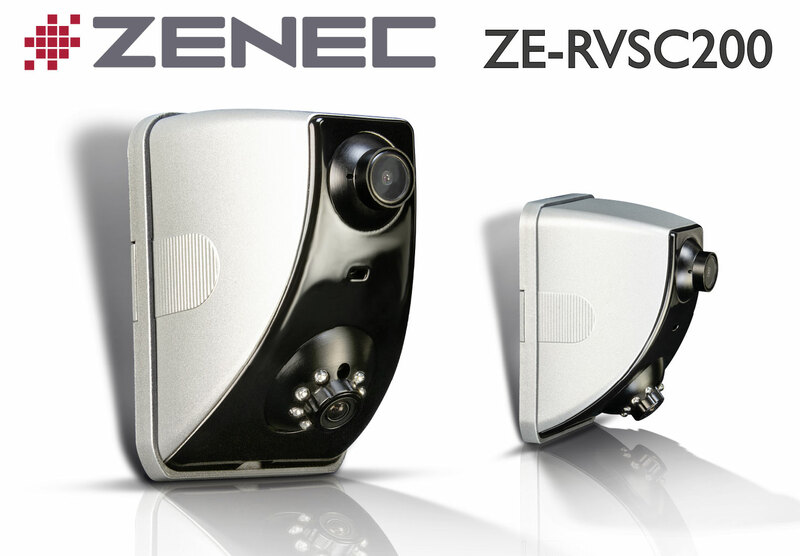 The CMOS sensors of the ZE-RVSC200 produce images of high contrast." Press can find more detailed information in ZE-RVSC200 press. Easy Multimedia retrofit in VW T5: The Z-E2060 is a versatile infotainer from ZENEC that can be easily upgraded to a navigation system. Convenient and affordable retrofitting of multimedia and navigation functions for VW T5 Multivan and T5 California vehicles – with the Z-E2060 of the E>GO model range. Brought out by the Swiss multimedia specialist ZENEC, the Z-E2060 is a versatile infotainer that integrates perfectly into T5 based VW vehicles. High end sound, enthralling pictures and films, optimal DAB+ radio reception, and clever smartphone integration – ZENEC's new E>GO makes every trip in the popular VW Bully successor even more entertaining. Also for those looking for a comfortable sat nav, the Z-2060 is the intelligent solution: With the Z-EMAP50 sat nav package available as an optional package, the infotainer can be extended to become a well equipped naviceiver." Press can find more detailed information in Z-E2060 press. 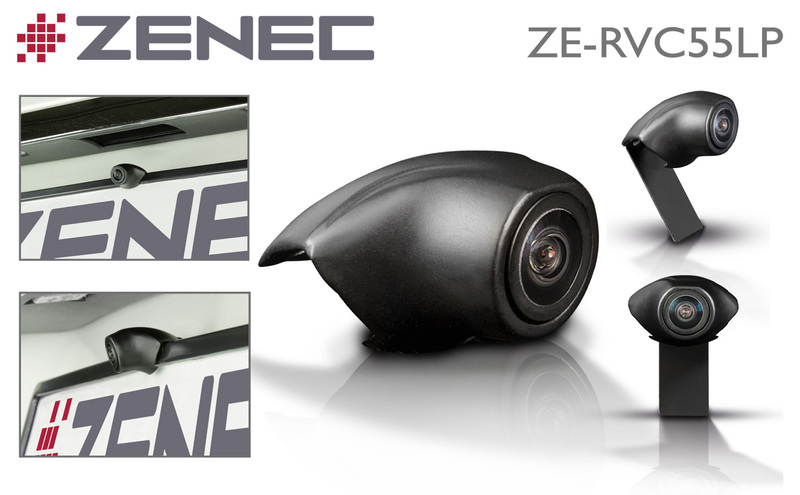 The ZE-RVC55LP from ZENEC is an easy to install rear-view camera that is simply mounted on the license plate frame. With the ZE-RVC55LP the Swiss multimedia specialist ZENEC now has a flexible license plate camera on the market that can be mounted with just a few simple steps to the existing license plate frame. The high resolution ZE-RVC55LP can therefore be used as a rear-view or as a front camera. For the image output you can choose between a normal or a mirror image. Equipped with a CMOS sensor that is very sensitive to light, the universal ZE-RVC55LP delivers a detailed, high contrast image, even in poor light conditions and during twilight." Press can find more detailed information in ZE-RVC55LP press. ZENEC‘s new naviceiver fits perfectly into the Fiat Ducato, Citroën Jumper and Peugeot Boxer, and is equipped with a special motorhome navigation software. With the Z-E3756 the Swiss multimedia specialist ZENEC presents a new motorhome naviceiver for the Fiat Ducato, Citroën Jumper and Peugeot Boxer. The Z-E3756 blends in perfectly with the original look of the vehicles, and can be comfortably controlled from the 7“/17.8 cm capacitive touchscreen. The integrated DAB+ dual tuner enables stable digital radio reception. A CD/DVD drive and two USB ports handle the playback of the latest audio and video formats. The comprehensive Bluetooth unit provides safe hands-free calling and comfortable music streaming. The special motor caravan navigation software of the Z-E3756 is optimally tailored for use in a motorhome." Press can find more detailed information in Z-E3756 press. Multimedia and infotainment on huge 8"/20.3 cm display for VW, Seat and Skoda – with the E>GO Z-E2050 the Swiss multimedia specialist ZENEC now has a system on the market equipped with every refinement. 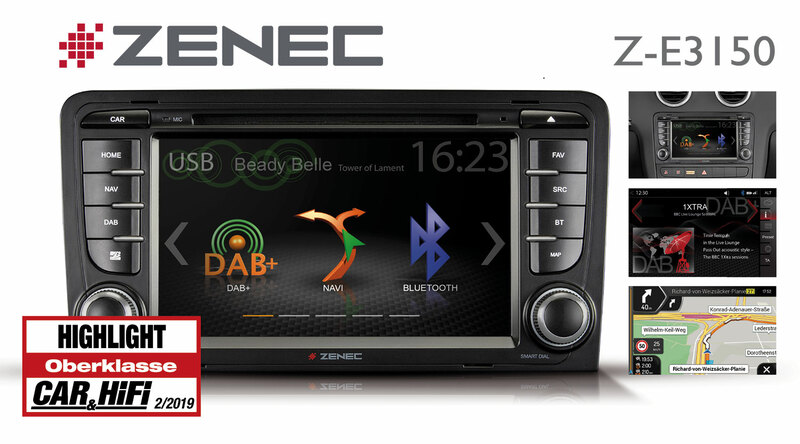 The Z-E2050 integrates perfectly in vehicles based on the Golf 5 and Golf 6 platforms, impressing with the very latest entertainment, including DAB+. The Smartlink Direct function allows easy connection of Android based smartphones to the E2050 and the comfortable use of apps. With the Z-EMAP50 sat nav package available as an option, the Z-E2050 can be upgraded to a navigation system with a full range of features." Press can find more detailed information in Z-E2050 press. 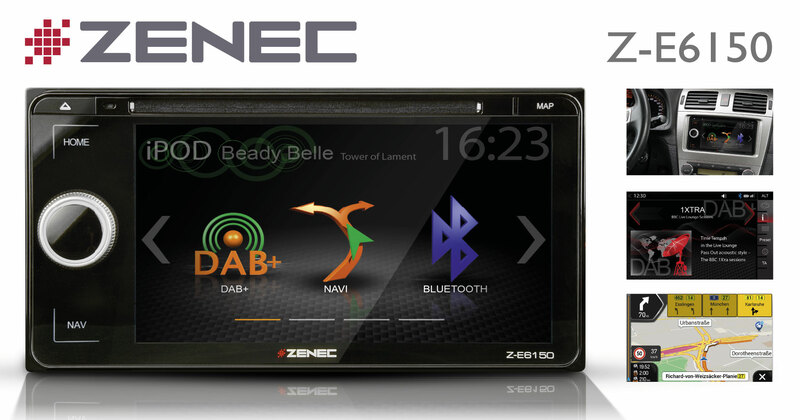 After the great success of the Z-N326, multimedia specialist ZENEC has now launched its next 2-DIN Smartlink infotainer, the Z-N426, additionally equipped with DAB+ and a larger 6.8"/17.3 cm monitor. The complete package of Z-N426 plus navigation software Z-N426-SDFEU obtainable separately has now been tested by Car & Hifi magazine in issue 01/2018, and awarded the "Best Product" accolade. "The ZENEC Z-N426 is a big hit", is the enthusiastic verdict of the trade journalists. "Superb range of features, use of phone apps per Smartlink, and excellent ease of use make it the benchmark in its price class." Press can find more detailed information in Z-N426 press. The new 2-DIN DAB+ moniceiver offers a varied entertainment program and enables the comprehensive use of cellphone functions in the car. 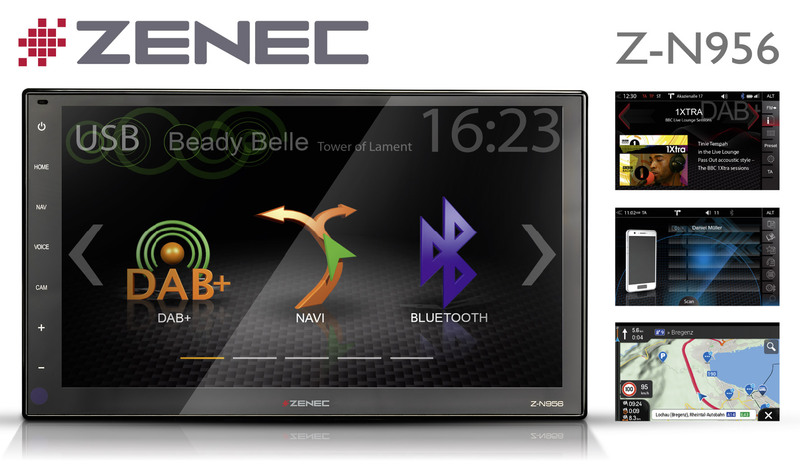 With the Z-N426 the Swiss multimedia specialist ZENEC has now launched a high performance infotainer on the market. The Z-N426 offers modern entertainment functions, including DAB+ digital radio, excellent sound quality, and the greatest possible ease of use. Thanks to SmartLink Direct the Z-N426 enables comfortable integration and use of Android and iOS based smartphones. But also for car drivers who want a versatile sat nav, the new ZENEC is a clever solution: with the microSDHC card Z-N426-SDFEU available separately the Z-N426 can be expanded into a navigation system with a full range of features. It does not have to be a factory fitted sat nav – with the Z-E6150 ZENEC has now brought out a tailor-made navitainer for Toyota. With the Z-E6150 from the E>GO Essential 2 series the Swiss multimedia specialist ZENEC has a state-of-the-art infotainer for the Toyota Auris, Avensis, Camry, Celica, Corolla, GT86, Hilux, Previa, Estima, RAV4 and Yaris in its product range: a system that integrates perfectly into the Toyota vehicles, that is an ideal entertainer via CD, DVD, USB and HDMI, is easy to operate, and gives you an innovative smartphone integration. 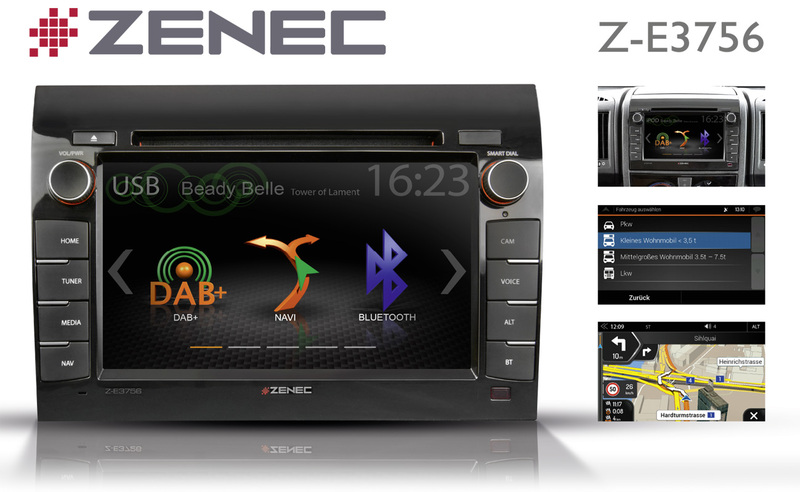 ZENEC's new multimedia system has a DAB+ tuner and a Bluetooth unit with many functions on board. The Z-E6150 can be expanded to become a full-fledged navitainer with 3D maps of 47 EU countries, more than 6.5 million points of interest, Lane Assist, and TMC. Press can find more detailed information in Z-E6150 press. 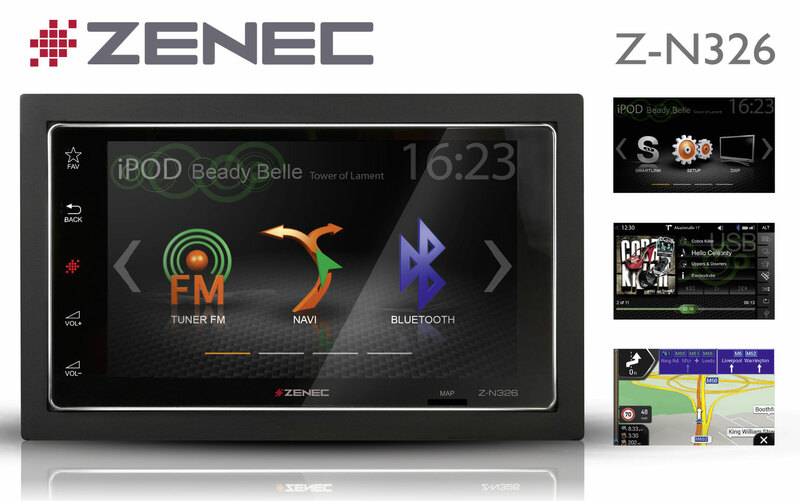 Flexible retrofit solution for any vehicle: the ZENEC 2-DIN system Z-N326 offers modern entertainment functions, allowing convenient mobile use of Android and iOS based smartphones. Press can find more detailed information in Z-E326 press. „Modernes Infotainment für BMW 3er E90 – E93“, urteilt die Zeitschrift Car & HiFi (02/2017) über ZENECs neue Multimedia-Navigation Z-E3215 MkII und zeichnet sie als „Highlight“ aus. Mit dem Z-E3215 MkII hat ZENEC eine Multimedia-Navigation im Programm, mit der sich modernes Infotainment einfach im BMW 3er E90 – E93 nachrüsten lässt. Die Fachzeitschrift Car & HiFi hat das neue BMW-Navi jetzt in Heft 02/2017 getestet und mit dem Prädikat „Highlight“ ausgezeichnet. Die Tester loben nicht nur die perfekte Integration der BMW-Navi in die Zielfahrzeuge, sondern auch die umfangreiche Ausstattung der Multimedia-, Bluetooth- und Navigations-Sektionen. Press can find more detailed information in Z-E3215MKII press. ZENEC's new premium navitainment system for VW, Seat, and Skoda models combines the latest communication and navigation functions with optimal in-vehicle integration and outstanding ease of operation. Market leader ZENEC is well-known for vehicle-specific permanently installed navigation systems that are specifically developed for certain models of vehicle, and impress with state of the art features and ease of use. With the Z-E2026, ZENEC now has an intelligent retrofit solution for diverse VW, SEAT, and SKODA models in its range. The Z-E2026 offers an optimal visual and technical integration in a vehicle, including connection to the optical parking system, climate status and multifunction displays, and a multifunction steering wheel. 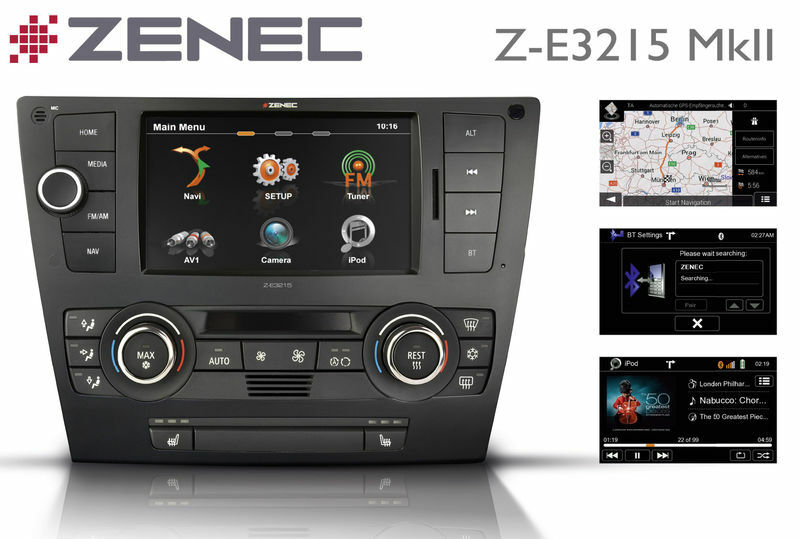 Equipped with state-of-the-art navigation functions, multituner system with DAB+, CD/DVD drive, USB connection, a powerful Parrot Bluetooth unit, and a smart link connection, the Z-E2026 is a premium infotainment system that leaves nothing to be desired. Please find the full press-release in our press section in Z-E2026 press. 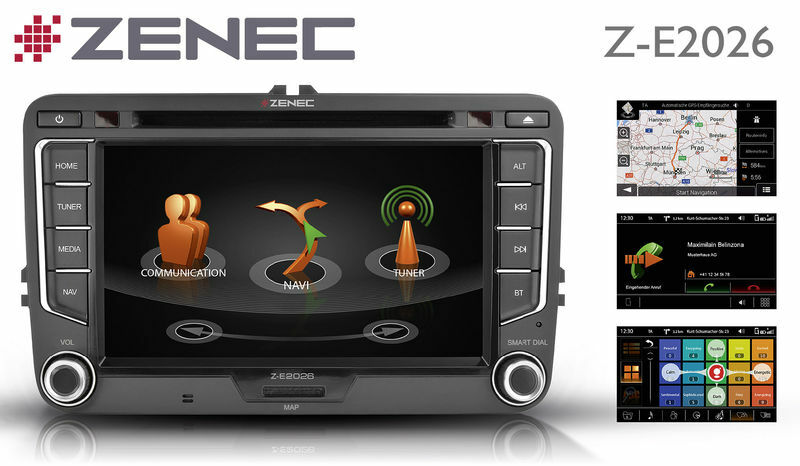 ZENEC's stationary navigation system Z-N626MH is easy to retrofit in any 2-DIN slot. Beside a full range of multimedia features, DAB+ and a top quality Bluetooth unit, it also offers special navigation software for motorhomes. 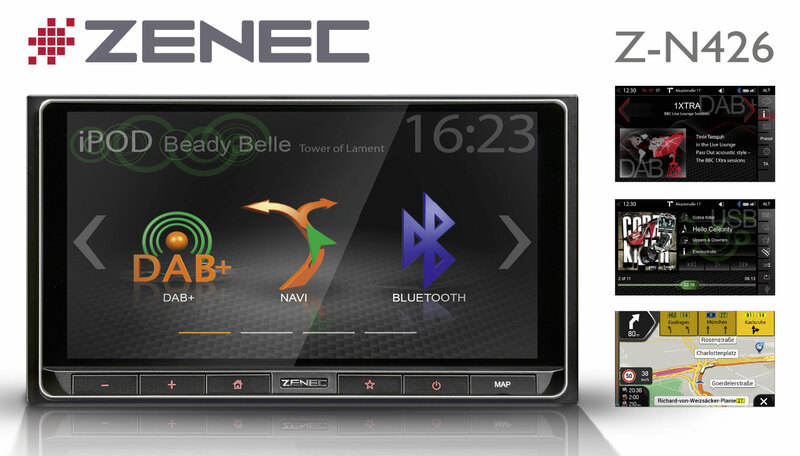 The multimedia specialist ZENEC has started off 2016 with a new 2-DIN touchscreen sat nav: the Z-N626MH, specifically developed for motorhomes, campers, and caravans. The innovative naviceiver is a clever all-in-one navigation, communication and entertainment package, including DAB+ that can easily be retrofitted in any 2-DIN slot. The special motorhome navigation software of the Z-N626MH is tailored to the needs of motorhome drivers. By choosing a vehicle profile and entering vehicle-specific data, any route can be effectively planned. Please find the full press-release to this test report in our press section in Z-N626MH press. 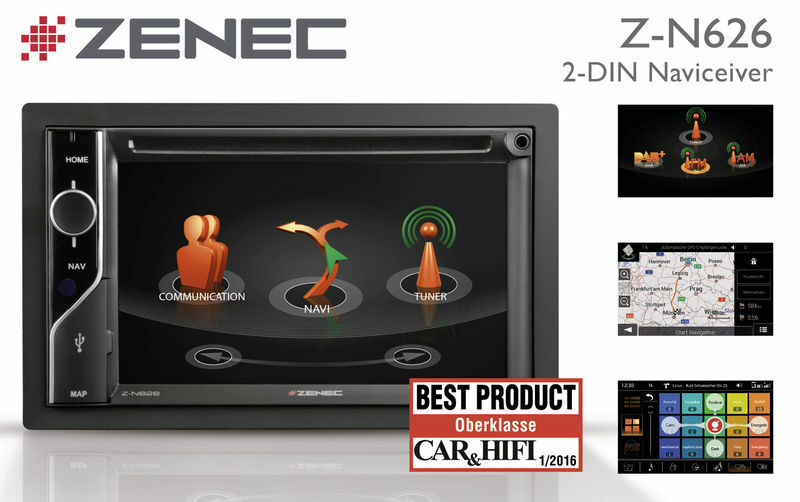 As the best naviceiver in its class, ZENEC's new 2 DIN multimedia navigation is awarded the ”Best Product” accolade from German Car & Hifi magazine (01/2016). 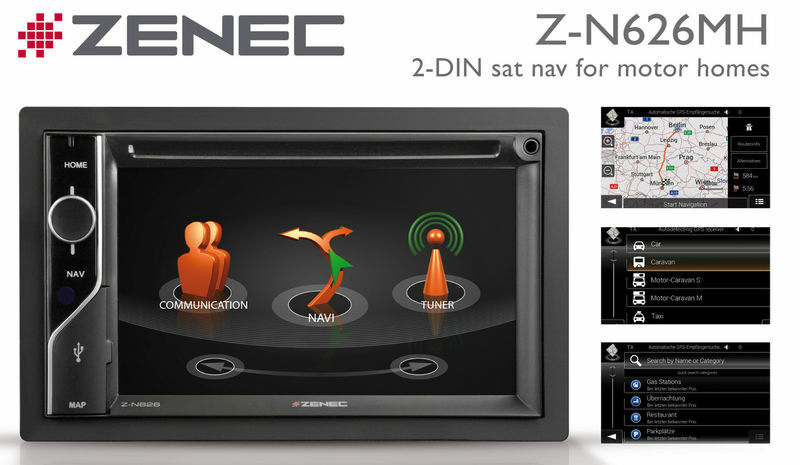 A permanently installed multimedia navigation system that will provide state of the art in-car navitainment for years has been in the product range of the Swiss company ZENEC, specialist in monitor sat nav systems, since summer 2015: the innovative multimedia naviceiver Z-N626 for vehicles with a 2 DIN slot. In issue 01/2016, the German Car & Hifi magazine has just put the device through a tough practical test, with the impressive conclusion: "price/performance outstanding" – "navitainment at the highest level". 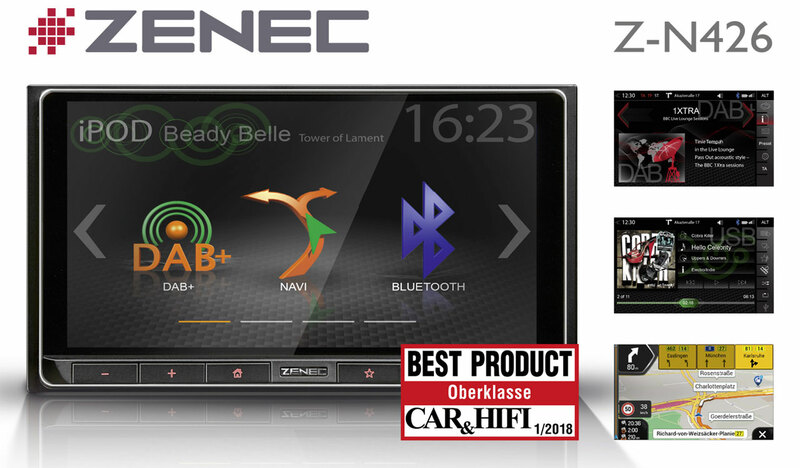 This qualified the ZENEC Z-N626 for the "Best Product" accolade among top of the range products (up to 800 Euro). Please find the full press-release to this test report in our press section in Z-N626 press. Z-E3726 wins award as "Best product"
ZENEC's new motorhome navigation system Z-E3726 was judged by the German Car & Hifi magazine (issue 6/2015) to be the ideal solution for all campers based on the Fiat Ducato, Citroen Jumper, and Peugeot Boxer. In the summer 2015 market leader ZENEC presented its new motorhome navigation system Z-E3726. Like its successful predecessor model, the Z-E3726 is a tailor-made fit for the Fiat Ducato, Citroen Jumper, and Peugeot Boxer. It is therefore suitable as a head unit for the majority of motorhomes. The specialist magazine Car & Hifi tested ZENEC's new motorhome sat nav in issue 6/2015, and was enthusiastic. The testers rated the price/performance as outstanding, and awarded the Z-E3726 the "Best Product" award in the category ”Top Class”. Please find the full press-release in our press section in Z-E3726 press. A new sat nav with DAB+, Bluetooth and many future-oriented functions has the Swiss multimedia specialist now with the Z-N626 in its program. 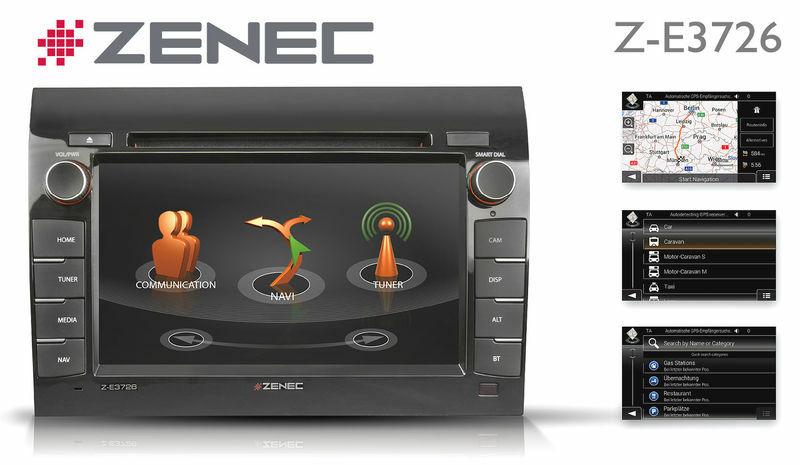 the Z-N626 naviceiver, an advanced allrounder, which fits easily in the 2-DIN slot of all vehicles. Thanks to its future-oriented functions – multituner with DAB+, compatibility with all modern audio and video formats, DSP based speaker management system, and comprehensive update support for navigation maps and software – ZENEC's new navigation system is well equipped for the future. Optimal vehicle integration and a lot of features – ZENEC's new camper naviceiver fits perfectly into the Fiat Ducato, Citroën Jumper, and Peugeot Boxer, and is equipped with a special motorhome navigation software. 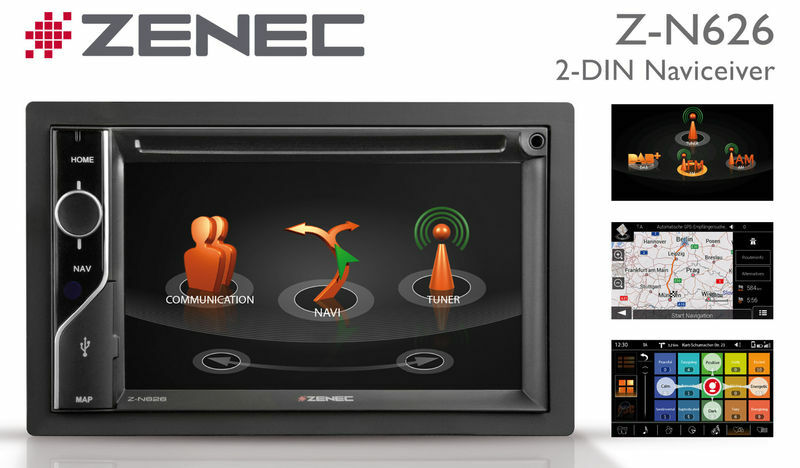 With the Z-E3726 the market leader ZENEC is presenting a new in-car navigation system of the E>GO range: a touchscreen multimedia naviceiver for the Fiat Ducato, Citroën Jumper, and Peugeot Boxer. The Z-E3726 is a clever all-in-one solution that provides a wide variety of entertainment, including DAB+, manages all telephone calls, and makes easy work of calculating even the most complex routes. The EU map package with 44 countries, and more than10 million kilometres of roads navigates using the very latest ZENEC Primo NextGen navigation engine, and contains over 6 million Premium POIs. The special motorhome navigation software of the Z-E3726 is tailored to the needs of motorhome drivers. Simply enter the vehicle profile and vehicle-specific data to calculate routes suitable for your specific motorhome. Detailed information on campsite and motorhome stopover sites throughout Europe is offered by the preinstalled, very comprehensive Camping POI package (descriptions in German language only).